Eric Keen does not work for, consult, own shares in or receive funding from any company or organization that would benefit from this article, and has disclosed no relevant affiliations beyond their academic appointment. In a fjord system of northern British Columbia, Canada’s westernmost province, a team of scientists, non-profits and an indigenous monitoring group have uncovered a curious humpback whale behaviour. Dubbed the “whale wave”, it suggests local displacement of the animals caused by humans may have more consequences than previously thought. By “wave”, researchers mean a seasonal shift in the habitats used by humpbacks. In the early summer, the whales concentrate in the outer channels of the fjord system nearest the open ocean. And, as the summer turns to autumn, they propagate further into the fjord system and deeper into the mainland. More than ten years of whale surveys indicate that this complex pattern occurs at roughly the same time every year. Though annually persistent and remarkably specific in structure, the whale wave is not the kind of pattern that is picked up in typical marine mammal surveys. That’s because such surveys usually spread their precious time over a broad area. In fact, the wave had gone undetected by several research groups in recent years, and it was only revealed thanks to more than a decade of annual local monitoring by the Gitga’at First Nation’s Guardian Team and their partners, the North Coast Cetacean Society (NCCS). The thousands of survey hours these two groups logged in all months of the year allowed them to detect this curious pattern. And their deep familiarity with the study area, born naturally from living in it year-round, allowed them to interpret it and work with scientists from Scripps Institution of Oceanography and NOAA-NMFS Southwest Fisheries Science Center to develop a new study to understand drivers of the wave. The wave’s discovery was recently published in a top-tier marine ecology journal. It included the work I conducted with a small team of students to better understand the drivers of this strange humpback behaviour. We worked with the Gitga’at and NCCS to develop a hypothesis-driven ecosystem study of fjord habitat and the ways humpbacks are using it. Mirroring the patient watchful approach of the Gitga’at and NCCS, we lived and studied from a research sailboat for the 2015 feeding season, from May through September. It all happened in the Douglas Channel fjord system, a beautiful and remote network of steep-walled corridors once known for its remote beauty and mysterious “spirit” bears (white morphs of the black bear). Today, Douglas Channel is better known for the slew of oil and natural gas tanker routes proposed for its winding waterways. Of the proposed tanker projects, the Enbridge Northern Gateway Pipeline was most contentious due to its crude bitumen cargo and associated risk of disastrous spills. But from a whale’s perspective, the spills are not the only concern. Fatal ship strikes, injury or starvation due to entanglement in debris, and disorientation and disturbance due to ship noise are some of the most probable of many potential consequences of increased large ship traffic within these confined waters. Since the Northern Gateway was finally shut down last northern autumn after the Gitga’at and other coastal First Nations won a prolonged legal battle, attention has shifted to the several liquified natural gas (LNG) pipeline and tanker proposals slated for the port of Kitimat at the head of Douglas Channel. The proposed tanker routes divide the Douglas Channel fjord system fairly neatly in two. Every summer, the whale wave passes up from the fjord’s outer channels to its innermost waters, overlapping with different portions of the proposed tanker routes as it goes. The humpback whale, loved worldwide for its complex song, picturesque flukes and fantastic aerial behaviours, is the most abundant baleen whale in British Columbia waters. 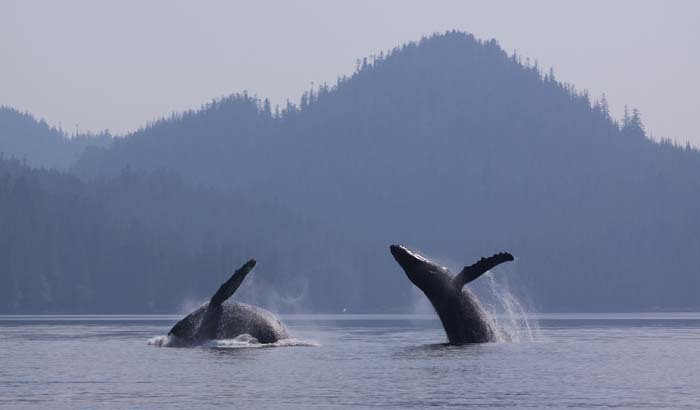 The Douglas Channel area has been proposed as a “critical habitat” for the feeding opportunities it provides British Columbia’s humpback whales. Several hundred individuals are considered “resident” to its confined waters. And this number is growing every year according to Janie Wray, lead researcher for the North Coast Cetacean Society, who has been studying the whales since 2003. Humpback whales are not the only cetaceans to rely upon the Douglas Channel fjord system. The area was proposed as critical habitat for Northern Resident and Bigg’s (transient) killer whales, and is being evaluated as a potential critical habitat for fin whales, the second-largest species in earth’s history. Some results of our study were unexpected. We were surprised to find, for instance, that the monthly distribution of prey was a poor predictor of the whale wave. “Our findings suggest humpback foraging needs within this fjord system are balanced against needs other than food and that the balance shifts through the year,” noted Janie Wray of NCCS. Other factors that may be in play include physical and social habitat needs such as the water’s depth and the acoustic properties of the fjords for communication and singing. And companionship for the purpose of travelling within a group or mating. Our findings suggest that this wave likely results from humpbacks familiarising themselves with this critical habitat over many years and developing specific behaviours coordinated to the specific oceanography of the fjord system that enable them to make the greatest use of its resources. We realised that this meant local displacement of whales by human impacts may have more consequences than previously supposed. We can’t expect these whales to simply pick up and go somewhere else if industrial activities, such as shipping lanes, disrupt continuity of critical habitats, such as the Douglas Channel fjord system. Until thorough habitat-use studies are completed, irrevocable management decisions should be treated with caution. The whale wave is a perfect example of the conservation value of small, long-term research partnerships of neighbours, which is a model that the Save Our Seas Foundation, a supporter of NCCS, has applied to protecting ocean species worldwide. What other intricate patterns in the sea could be going unnoticed by visiting scientists on their chartered vessels? Perhaps there are some discoveries that reveal themselves only to those who are residents first, and scientists second.